Hi folks! I am headed out on vacation tomorrow, but wanted to put up a post before I left with the remainder of the Amazing Spider-Man data that I put together the other day. This set of data is for issues 35-50, and there are a few interesting things that I think can be drawn from the data, one of which was a little surprising to me. Issues 35 throough 44 are sort of what we would expect. 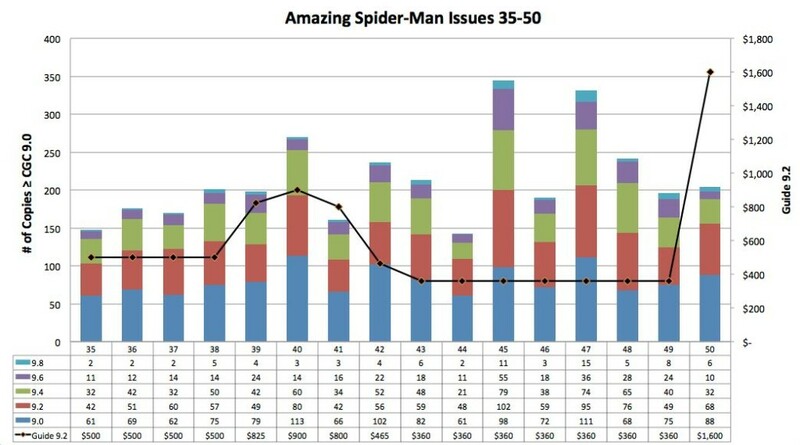 A small bump is seen for higher grade copies for issue 40 (Green Goblin cover story). This isn’t surprising given that there are a total of 1204 Universal copies graded which is quite a bit higher than the surrounding issues. So, proportionally, this issue has been submitted more often, and you would expect more copies in higher grade. Copies of issue 41 (first Rhino) in high grade are a little low, but not a lot of these have been submitted with a total of only 687 Universal copies graded (compared to the 1204 cited above). For completeness here, note that there are 981 copies of issue 39 in Universal grade. Make of that what you will. Issue 45 and 47 have the classic feel of warehouse books, but not overly so (small warehouse? ). Issues 43-49 all have the same guide price, so the spikes on 45 and 47 indicate that there seem to be more of them out there that did not get molested in quarter bins. But, for some reason, issue 46 did not share the same fate. Total universal graded copies for issues 45, 46 and 47 are 783, 555, and 714 respectively. The most interesting thing is issue 50. First King Pin in this issue, so it has a much higher guide value in 9.2. But despite 1457 Universal graded copies, the number of high grade (≥ CGC 9.0) issues is small in comparison. 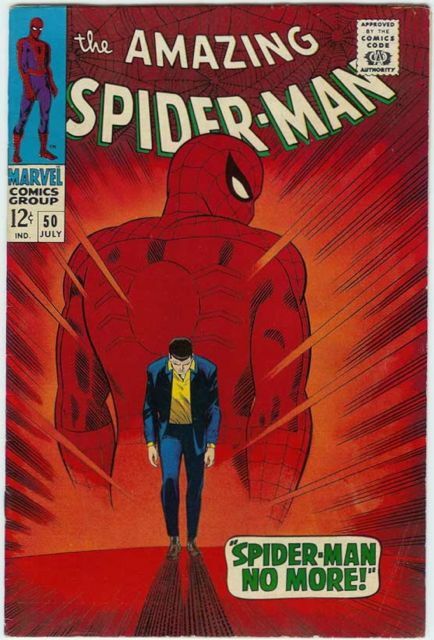 This could be the result of the dark red cover I suppose – that certainly seems to have played a roll in the scarcity of issue 28 in high grade, which we discussed last time. So…some common themes are emerging in all of these silver age books. Some big and medium sized warehouse spikes, dark covers (or ??) causing scarcity of issues in higher grade, and some issues that just randomly seem to be scarcer than other books. This is by no means scientific…but staring at the data does make one wonder! I’ll be back in a week or so to look at something from the Golden age…time to go back in time a bit! P.S. Check out these silver age Amazing Spider-Man comics on eBay! 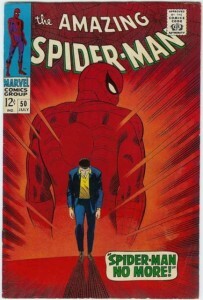 This entry was posted in Amazing Spider-Man, Marvel and tagged Amazing Spider-Man. Bookmark the permalink.